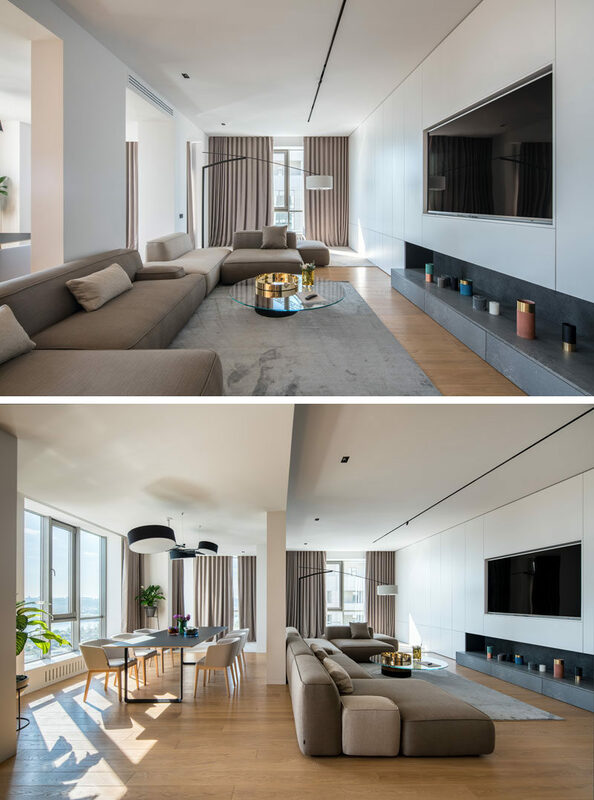 Maxim Doschisnky and Pavel Voitov of ZOOI interior studio, have recently completed the design of a large apartment in Kiev, Ukraine. 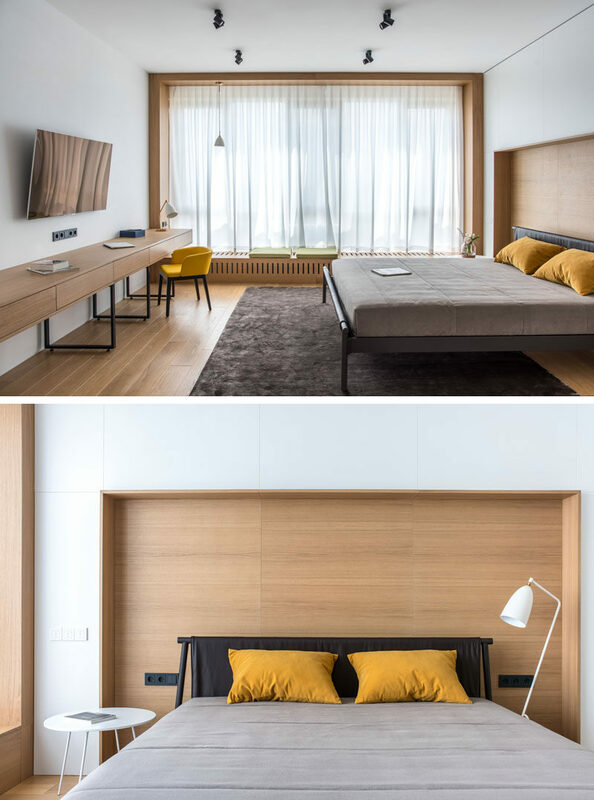 Three apartments were merged to create one large apartment for a young family and their guests. 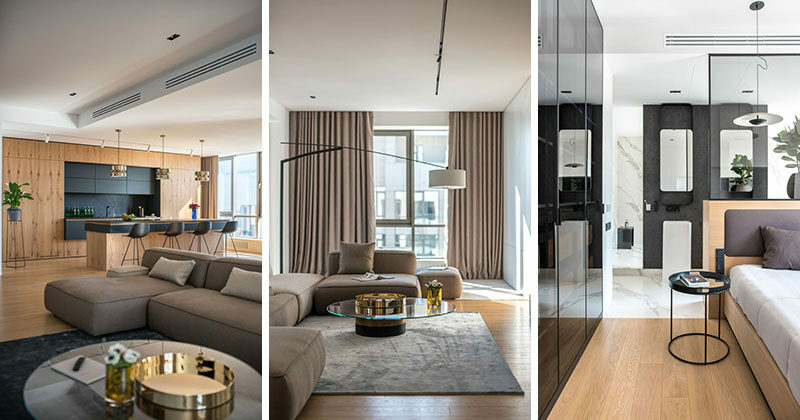 The main living spaces all share the same open space. The living area is long, with the couches focused on the television, and a window at the end of the room. Behind the living room is the dining area. 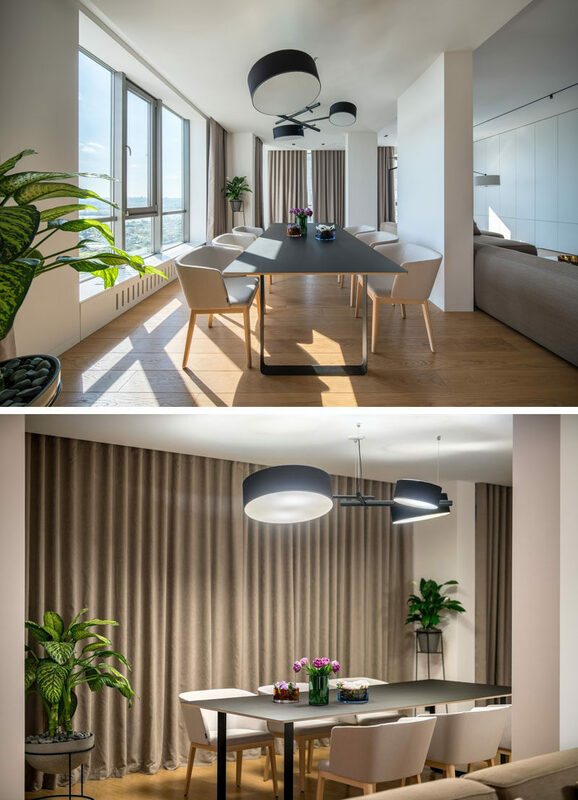 A minimalist dining table sits below a chandelier with drum shades, while a window provides views of the city. At the end of the dining area is the kitchen. 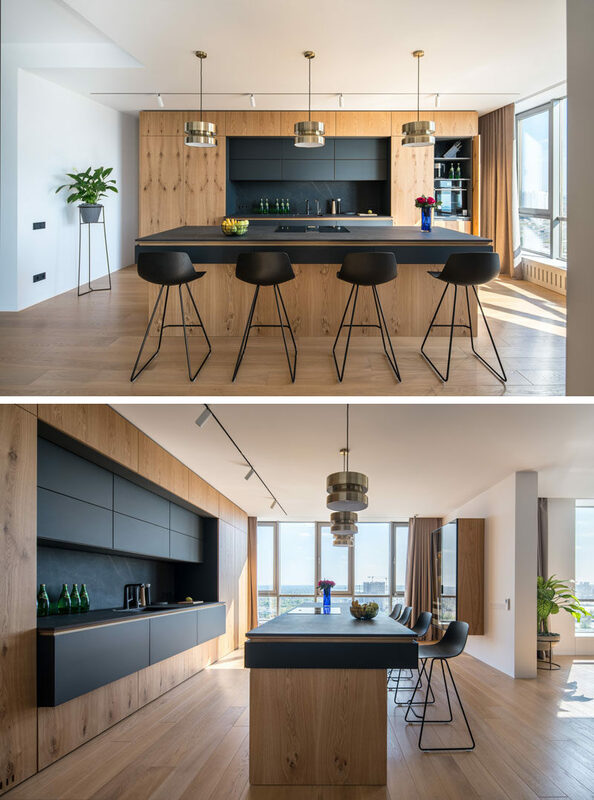 The black cabinets and countertops contrast the wood, while brass accents add a touch of glamour. 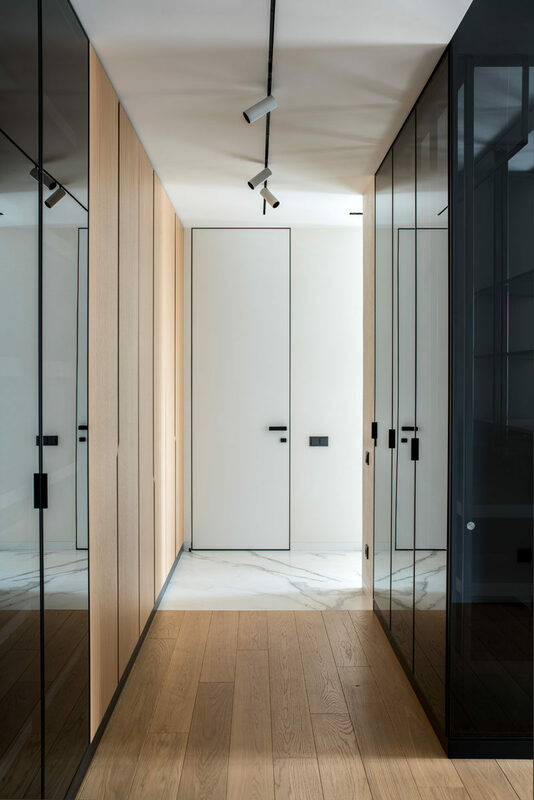 Down a hallway and stepping into the master bedroom, there walls of black closets that lead to the sleeping area. 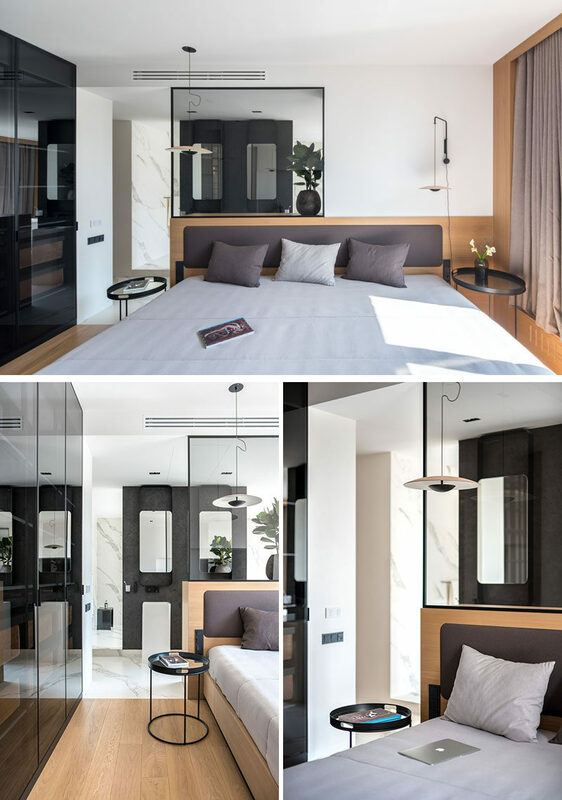 In the sleeping area, the bed has a simple wood backdrop, while transparent glass provides a view through to the ensuite bathroom. 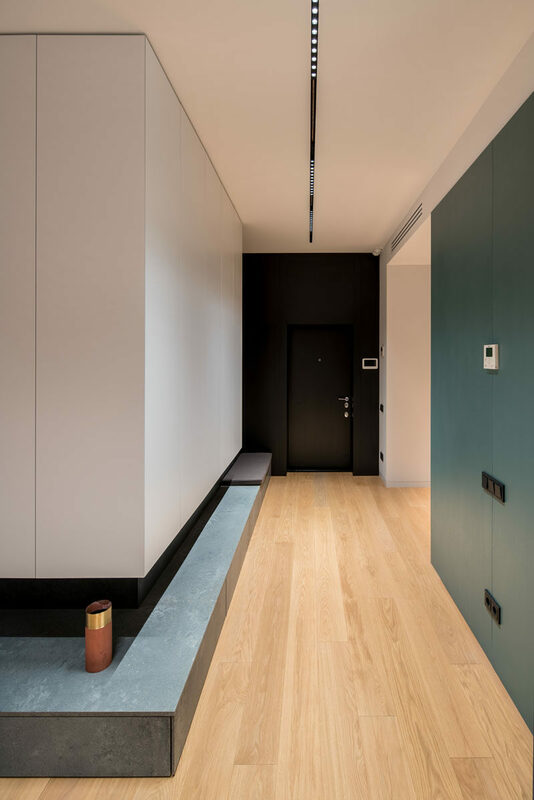 A dark feature wall behind the basins complements the dark closets in the bedroom, while the wood shelving unit is part of the wood backdrop behind the bed. 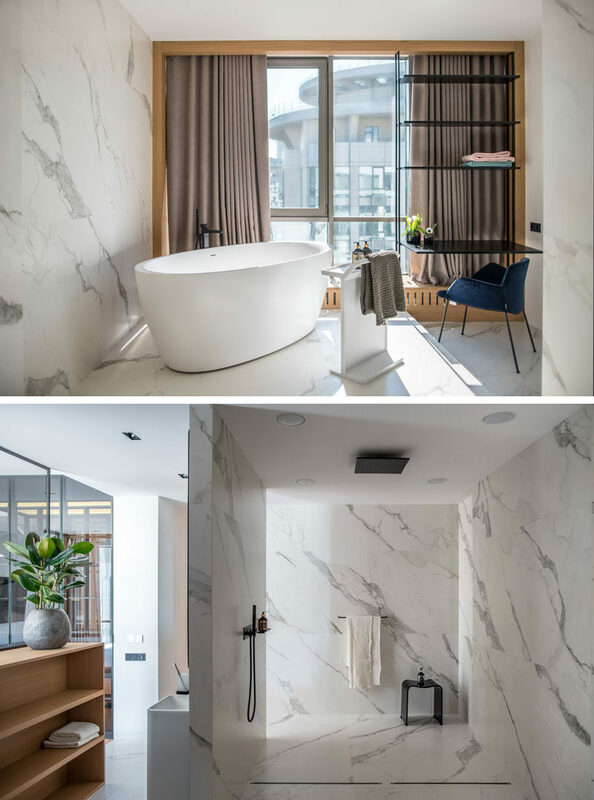 The bathroom opens up to an area with white marble tiles covering the walls and floor. 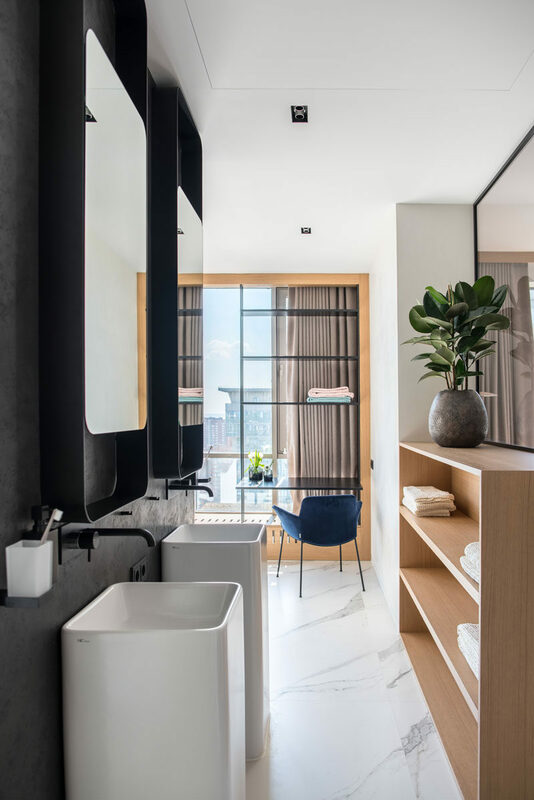 The freestanding bathtub sits in front of the window, while behind it, is an open shower. 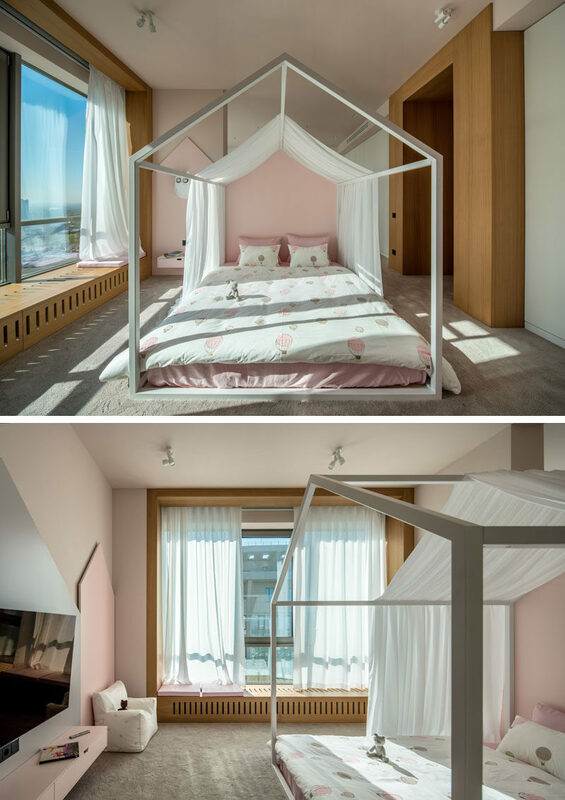 The children’s bedroom is divided into two zones, the first being the sleeping area, that’s decorated with a ‘little house’ theme. A wide wood window sill creates a place to sit and look out the floor to ceiling windows. The second area of the children’s bedroom, is a play area with the same ‘little house’ theme. A floating desk creates a place for doing homework, while a hanging chair is perfect for reading. 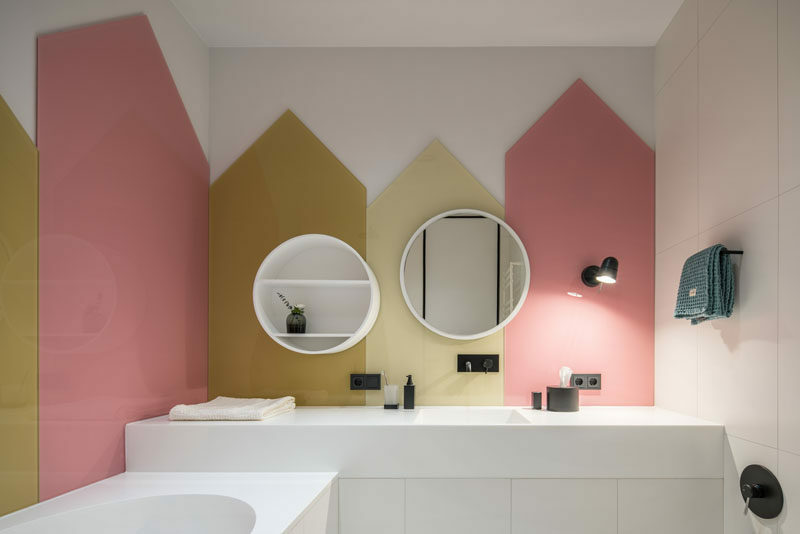 In the children’s bathroom, the ‘little house’ theme continues in the form of colored glass panels on the walls. 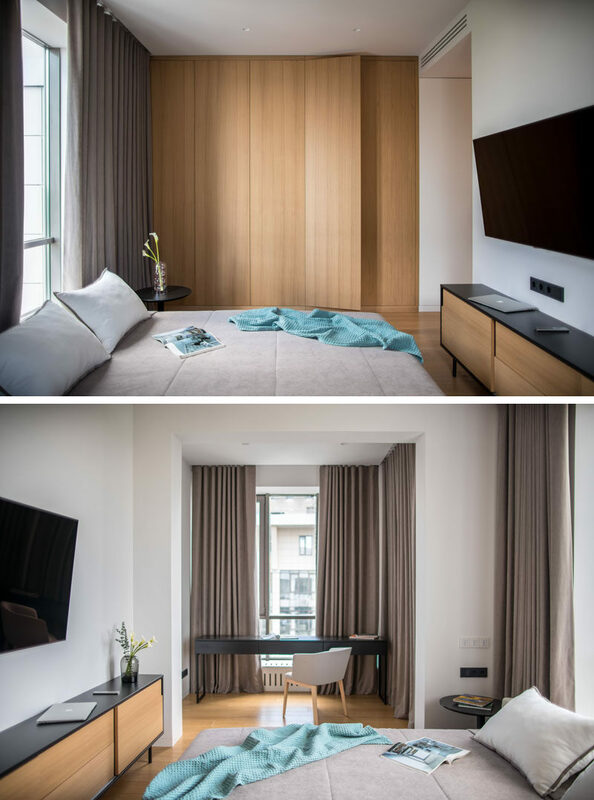 In a guest bedroom, a wood alcove creates a designated position for the bed. In another guest bedroom, there’s a floor-to-ceiling wood closet, and a desk area that’s been positioned in a small alcove by the windows.